ne of our favorite locally-based designers, Ming Wang, is sponsoring a fabulous Fort Worth event that you don’t want to miss. On October 25th at the Colonial Country Club, New Day Services will present a beautiful fashion show and luncheon to help raise funds for help and hope to the children and families it comes in contact with through the Tarrant County Family and Juvenile Court Systems. That help and hope comes in the form of chaplains, educational classes and resource referrals within the community to agencies and churches. Ming Wang will present their fashions that flatter at any age, while helping a local organization focused on spreading a positive message. Character Counts! – weekly character-building classes taught to detained juveniles to assist them in making better life choices. Financial Life Skills – a weekly class taught to detained juveniles to educate them in how to apply for employment, the importance of work ethic and basic money management. FOCUS (Fathers Offering Children Unfailing Support) – a comprehensive education program addressing the challenges connected with child support. The FOCUS Class for Fathers is a series of 10 weekly classes for non-custodial fathers who are behind in their child support payments. Kid’s Quest – a 4 hour activity based seminar for children of divorce, ages 4 – 12 years old, that gives them the information and skills they need to better handle the changes in their lives. This program is offered only as sponsoring organizations, businesses, civic groups or churches are available to help with its presentation. Access Without Conflict – a 3 hour class, full of visitation tools and communication strategies, designed for divorced or divorcing parents that stresses the importance of both parents remaining active in the life of their child after divorce. Offered monthly at the NewDay office in the Family Law Center and at the same time and location as a Kid’s Quest session. Time to Take Control – a class for the growing number of non-custodial mothers who are behind in child support payments and facing probation. This class addresses the barriers to employment, identifying situations that the mother has control over, parental responsibilities and healthy relationships. Attendees for this class are referred by the Community Supervision Unit of the Tarrant County Domestic Relations Office. 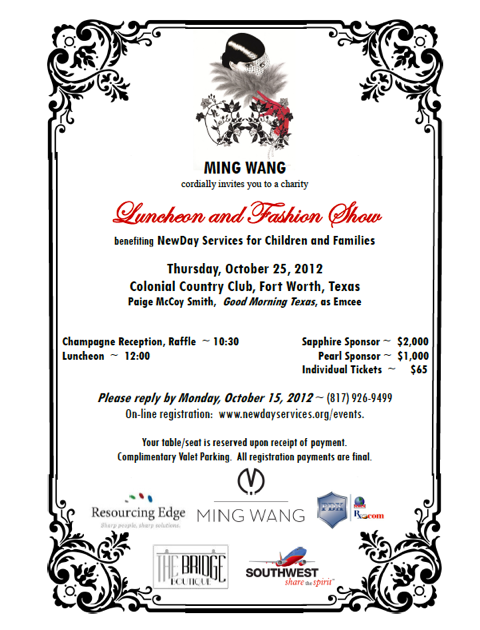 So, come join the fun by eating, drinking, and being merry with Ming Wang and New Day Services!